Godhuma Ravva Upma or Wheat Ravva Upma is one of the most common recipes in south India.This Upma turns out really nutritious by adding the leafy vegetables a great way to incorporate greens into our daily cooking.A Healthy twist to a reguar wheat ravva upma. 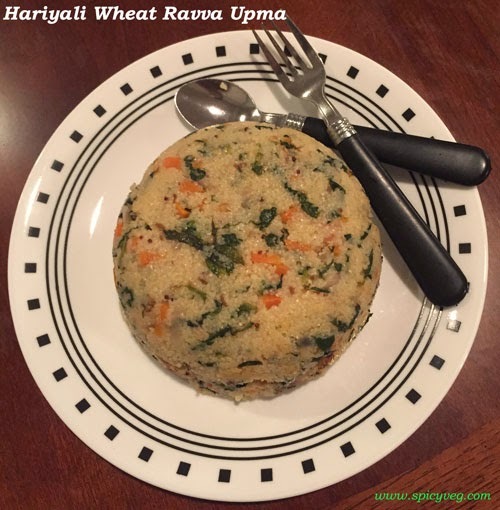 Hariyali Wheat Ravva upma is a simple, healthy and easily digestible , that can be made either for breakfast or dinner as a one pot fully satisfying meal. 1.Heat a heavy bottomed kadai with 2 table spoons of oil. Saute it with mustard seeds, urad dhal, channadal and once they splutter add red chilli and hing and fry for few seconds. 2. Now add Choped onions and green chillies fry for 2 minutes,add tomatoes ,carrot and green peas fry for another 3 minutes. 3. Now add Spinach, Methi Leaves, Amaranth leaves (Thotakoora) and fry till the raw smell goes. 4.Now add the wheat ravva and fry well for 2 minutes in medium flame. 5.Add required salt and 5 cups of water. Mix well and close the pan with a lid. Keep the stove in low flame for 20 minutes or until the all the water gets absorbed. If the water is absorbed fully and the upma is well cooked switch off the stove. 6. Serve hot with cup of curd.